For the football loving gamer this is usually an annual question with an easy answer. If you prefer real stadiums, teams, leagues and players as well as some great graphics you pick Fifa. If you prefer subtle controls, a more realistic game and some flowing animations you pick PES. For me PES has always been an easy choice. Fifa suffered from repetitive gameplay, easy goal scoring and a real lack of challenge. PES was tough and I felt a better sim of football. However the last release of PES on the 360 was disappointing. Stuttery graphics and more importantly gameplay that was far less fluid than the PS2 version had left a bad taste in the mouth. Online wasn’t bad but it wasn’t exactly glowing either. A subsequent patch had left it almost unplayable as it would drop half way through a match. 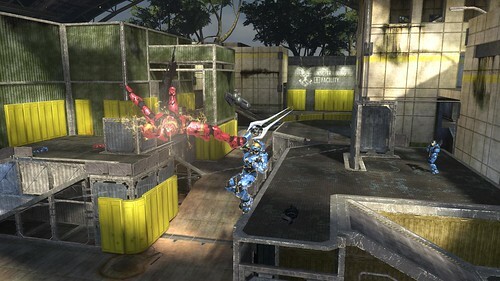 The demo’s for this years versions pointed to a far closer battle. PES was smoother in game than before but still stuttered badly in replays. Fifa felt very slow but had a lot more depth than previous versions. Both had camera issues but that was down to poor options in the demo. So I stumped up for PES yet again. The game was a lot better than last year with all in game stutter a memory that only returned during replays – they were awful! The gameplay was also smoother with a lot more depth and a nice feel to the game. Strict referee’s were back but once again i was happy with PES. Online though was a kick in the teeth. The first online PES 2 years ago was a mixed bag. Cheats could quit without penalty and the net code wasn’t the best. But it did allow 2 vs 2. Last years was less laggy but cheats could still prosper. Also the hosting was shared between the two gamers…meaning you could have a great first half if your hosting followed by a horrible, laggy, torrent spoiled second half. 2 vs 2 was also dropped. This year still sees only 1 vs 1 and the couple of games I played were mixed. Seemed to go OK but after a period the lag was horrendous making the game unplayable. It was PES but only just. This was disappointing especially with Fifa promising online leagues, a way of playing for your team online and also a 5 vs 5 mode. To be honest I laughed when I read that – they’ve no chance of getting that to work well. A couple of trusted friends eventually bought Fifa….and loved it. It didn’t have the depth or the fluidity of PES but online it rocked and the 5 vs 5 mode…..worked a treat. I’ve had the game over two weeks now and it is superb online. 1 vs 1 and up to 5 vs 5 is a very special game mode. Lag free and just a joy to play. It can be spoiled by greedy and mouthy players but played with a few friends is a great experience. Graphically the game is good although sometimes the animations are a bit clunky. Sometimes the game can frustrate as it just isn’t as good as PES. However the online mode is so good you can overlook those issues. You also have the ability to create your own public and private leagues, upload video’s and pictures to the net and take part in matches representing your team. Offline has much the same modes as PES but not to the same depth as PES master league. If you only play offline, PES. If you are going to play online at all or never have done but like multiplayer gaming them Fifa is for you. It’s been a long time coming but Fifa has finally bettered PES this year for me. If only Konami could get near Fifa’s performance online – what a game that would be. Still loving it, campaign on legendary is very hard, multiplayer is very very good and the ability to download maps and game variants that other people create and share offers so much life. We played a rocket racing mode tonight which was great fun. There have been lot’s of reviews but I’m wondering…another 10 from Edge? I think it would be justified and would also be the first game series to be awarded two 10’s. So I’ve had 3 or 4 hours on Halo 3…enough for a quick opinion but not much else. It’s a very pretty game. There’s been a lot of talk that it’s not up to par with Gears or Bioshock but in those games you only see a few enemies at a time and the levels are small and enclosed. 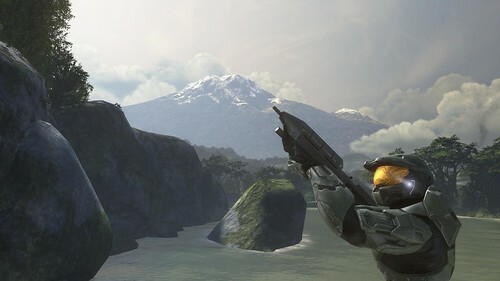 The maps in Halo are very big, have lot’s of enemies, ships flying around, vehicles etc and I think it looks stunning. No glitches, always smooth (although I haven’t played much) and a very solid feel. They are also far more colourful than the drab, but detailed, Gears and Bioshock. I’ve only played through a tiny bit of the campaign (screenshot from my campaign trial this afternoon) as I’m keeping that for co-op only. The sections I did play were pretty tough and the AI seemed much improved. I also kept running out of weapons and didn’t get to see any new weapons at all. Still, early days for the campaign. I played on heroic although fancy doing co-op on legendary to keep the challenge high. Looking at my friends list today there were a couple of folk running through the game on normal….looks like they took 6-8 hours to rattle through the game. So play on at least heroic to enjoy the game at it’s best. Thank goodness co-op mode was added as this will probably be the first Halo campaign I will actually complete. However the campaign is the smallest part of Halo 3 – the emphasise looks to be on multiplayer as that’s what will keep gamers occupied for the next couple of years. I say years as I played and enjoyed Halo 2 for over two years and I hope this latest version has as much depth online as the previous version. I’ve only really played Team Slayer (4 vs 4) and on 4 maps so far. Firstly, no lag to be seen. Second, no cheating either. The new weapons offer quite a varied arsenal and it will take a while to get used to them. Old ones have also been tweaked. Sword for example does not last forever and also takes longer to pull out and use – it’s still powerful but not as much as in Halo 2. Gameplay hasn’t changed too much but that’s a good thing as there wasn’t too much wrong with Halo 2. Bungie have addressed some community issues though. No more listening to morons on Live screaming, swearing, shouting, calling you gay, asking if you want a cup of tea and a scone. There’s a variety of options including not hearing opponents and being able to quickly mute your team. They’ve also introduced push to talk which has quietened things down too. It made for a far more enjoyable online experience. There seem to be many more online game modes with the ability to create your own and share those creations with friends. Rocket Warthog racing anyone? I’ve not had any time to dabble with Forge which is a game mode in it’s own right that allows one team member to drop weapons, vehicles, change spawn points – basically customise the map to their hearts content. This is another option that should give longevity to the title. Bungie have also increased web and community integration. Using the theatre mode I can share film and screenshots with friends and also via the Bungie website. I can download screenshots from Bungie and also select in game clips from the website to view on the 360. As the movies use the in game code you can only view the movies in game on the 360. How lovely (but massively bandwidth intensive) would it have been to save movies to a Bungie Youtube equivalent that could have been used to share in game movies with anyone? They have also made it easy to see what your friends are playing and how far they are in their game and they’ve upped the post game analysis details on their website. The screens above are all from my short play time this afternoon (Flickr set here and will grow over time). The top picture shows the level of detail seen in the campaign mode. The next two are from one game of Team Slayer. 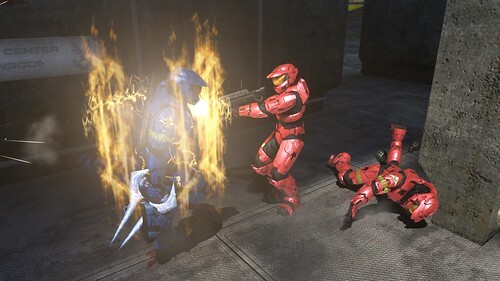 The second picture is me wielding a sword and about to double kill another red guy. The last picture is an in air kill, again with the sword. You can also see a team mate sniping form right to left. The level of detail (bullets, blood etc) in incredible and a great example of how good the Halo 3 engine really is. That’s about it really. A cracking update to the Halo universe and something I’ll look forward to playing for many months. Call of Duty 4 though will provide some stiff competition as it’s online mode is excellent. I probably played my last game on it tonight though as most of my friends will be picking up Halo 3 tomorrow. Let the big team battles begin. As if the deluge of new games wasn’t enough, how do you fancy some old school shoot-em up action? First up is Geometry Wars:Waves. Looks good although the only downside is that you can’t buy this as a separate arcade title – you need to buy PGR4. Is that really a downside? The other shooters are some console classics from yesteryear – Ikaruga and Rez. Rez can be best described via YouTube. Ikaruga is best described as too fecking hard and that’s not according to Wikipedia. Good to see some more recent classics hitting Live Arcade. Just need a release dat for Sensible Soccer now.